Modern painting master class for beginners, where you can learn the basics in 4 hours, singly make a picture and get acquainted with interesting people. All used materials are included in the cost of the master class. On the master class we will write a small still-life. At the beginning of the master class the teacher will talk about the basics of composition, a using of color and a technique of painting. You singly will write a still-life with acrylic paints. If necessary, the teacher will advise you and help in building the composition and working with the form and color. At our master classes there is always a positive atmosphere of communication and there are different, interesting and creative people who can inspire with their creative and life experience. 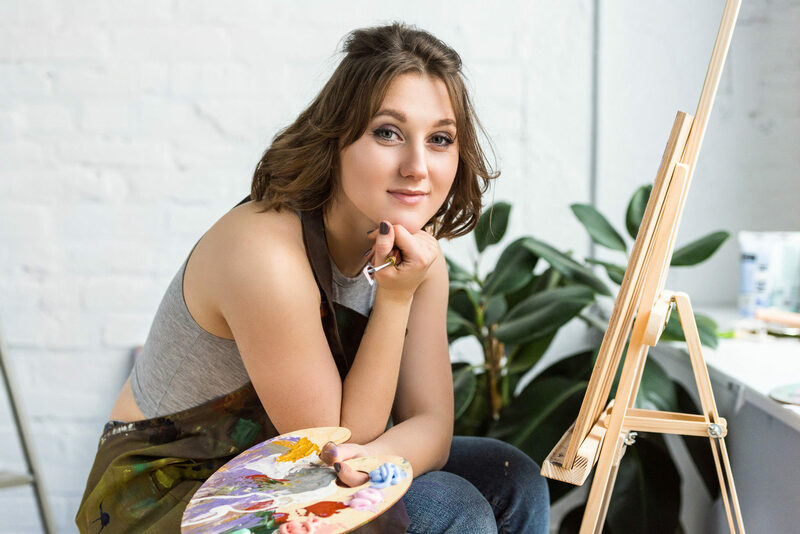 Jane graduated The Norwich University Of The Arts in 2010 and gives contemporary painting and drawing lessons for 6 years already. In addition to teaching, she painting in modern style and post-impressionism style, she annually exhibits her works at international exhibitions. I've been on Jane's master classes 3 times already, and with every time I've learned something new and interesting! I really like how she presents the theory and helps to develop an individual style. Recently I've been on the Jane's painting master class and was very pleased. I had never painted before, but thanks to the help and advice from Jane, I did a pretty decent job. I have been painting for several years and decided to go to this master class, because I had been advised by many friends. In the end, I didn't regret and learned a few new important tips. Thank you! Don't know what to give to relatives? Practical painting master class is a universal gift that will suit all creative people. To order a certificate, specify the note "Gift certificate" in the comment. Does it make sense to come if I don't know how to draw at all? Yes, the master class program has been designed for beginners, you will draw an uncomplicated still-life, and the teacher will help you and advise you if something doesn't work out. What materials will we be using for painting? On the master class we will be painting with acrylic, because it dries fast. You can take your work right after class. We will be painting on canvas with size 30x45 centimeters. How long does the lesson last, will we have a time to finish the picture? The lesson lasts 4 hours. Since the still-life consists of few details, and the size of the canvas is small, you can easy finish it during this time. An entrance from the Mott Street. A second floor, a first door on the left.